Truth Surfer: Coleman's Trick or Treat? 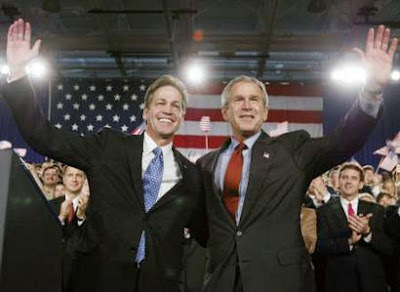 Minnesota Senator Norm Coleman seems to be farting one faux pas scandal after another these days…that is when he isn’t try to blame others for the smell left behind. Lets see… gifts of...Nieman Marcus suits, trips to the Bahamas, trips to Paris (btw he put down the value for a private Paris trip as $2,870…yeah that alone should be investigated! ), fishing trips to Alaska, money from convicted buddy Ted Stevens, and now…Coleman’s wife on the dole. "The CEO of a major marine technology company is alleging that he was pressured by a friend and associate of Norm Coleman to secretly funnel tens of thousands of dollars to the Senator's family." "While it's possible the DoC's website has out-of-date information, it might be worth asking Sen. Coleman what exactly the Hays Company paid Mrs. Coleman for, and if her role there had any influence over these alleged illegal donations." It’s more than a bit suspicious when Laurie Coleman, a model, is on the payroll for $75K to a company that provides risk management consultation to Deep Marine Technology. And it’s just downright pathetic when they release a statement blaming the Franken campaign….especially when the lawsuit on this has been filed by a Republican Texas businessman. Now perhaps Norm is innocent? But if that’s the case them why act like this here when first approached and asked about it. Then in a statement the next day respond like this. Ask yourself how would any mature professional who did nothing wrong respond? We would open the books and ask for an independent investigation with full cooperation. But instead we have Coleman blaming others. Norm has shown us he’s not willing to answer questions regarding this apparent criminal behavior but given he's called for Ted Stevens to resign for similar activities...can we expect more to come?